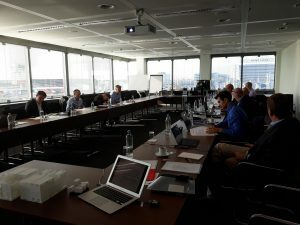 The second European – High Level Industry Group (EHLIG) meeting was held in Amsterdam on 26th September. As well as the first edition, this event joint together logistics experts and high-level executives to discuss and give feedback on the results and innovation. During the expert meeting organized by CLUSTERS 2.0, Elvina Nowak from Euralogistics presented a brief glance of Euralogistics work and the “massification” concept related to logistics needs. In addition to the main massification advantages, Nowak stressed the advantages achieved on the approach implementation in Dourges. Here you can find find the detailed presentation. Davide Scatorchia from Aircargo Belgium gave a short introduction about the Slot Booking App as a new solution for freight delivery and booking needs. Bookers, suppliers, freight forwarders and ground handling agents could be benefited from this app. To see the details about Slot Booking App please link here . 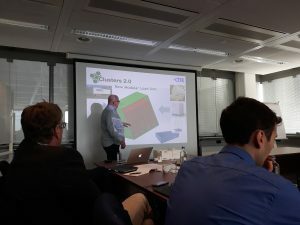 Ton Bertens from Vaneck Group presented the New Modular Loading Units (NMLU) and innovative handling equipment status as a new advanced solution within the CLUSTERS 2.0 project framework. The new NMLU will be a real solution for packaging and stocking needs, although the Alt 3 NMLU modular prototype faces some building challenges. Check the full details on this following link. Some of the main recommendations and conclusions of the meeting are the combination of the parts (Massification, Slot Booking app and NMLU) is really interesting and should allow for more efficient prices and avoid empty runs. They also considered the feasibility and viability of the project as positive and they recommended the project to put on practice for people to join.